Getty ImagesCristiano Ronaldo and the 2017 bust. A bust of Cristiano Ronaldo – kept at the Cristiano Ronaldo Airport – was widely derided in 2017. You can see Santos’ second attempt below. 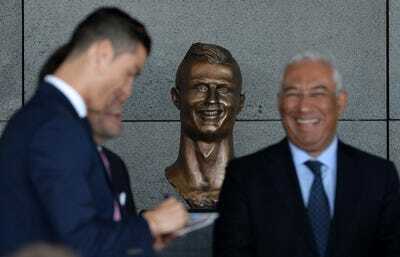 The statue looked so bad it was mercilessly mocked on social media and bore a greater likeness tothe Mad magazine kid Alfred E. Neuman than it did to the famed Real Madrid and Portugal national team striker. Now, one year on, the sculptor Emanuel Santos has updated the bust – but is it an improvement? Bleacher Report / screenshotThe Cristiano Ronaldo do-over. Sports website Bleacher Report challenged Santos to unveil the second bust on the one year anniversary of his first, universally derided, attempt. It was a challenge Santos accepted – and the sculptor is delighted with the finished product. “It’s very good,” he said in a ten minute Bleacher Report documentary. “The [first] one of Ronaldo I made, if I hadn’t done it the way I did, it would have been forgotten a long time ago. So, sometimes it’s necessary to have a certain bravery to go against the usual and have an impact. 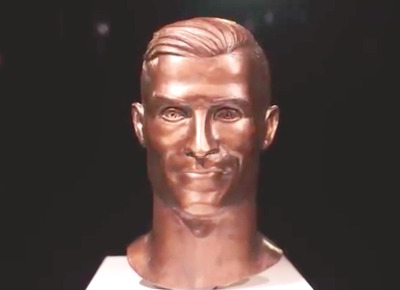 Santos’ updated bust is a more polished version with a greater likeness to its subject – Ronaldo. Emmanuel Santos, the chap who did the awful Ronaldo bust, was challenged to do another one and accepted. However, some people seem pleased with Santos’ second model. Compare the two side-by-side – which do you prefer?